Alpina brings us 8636/4 TELMA a stylish beige wedge shoe that can be styled to wear during the day or night while your feet enjoy complete comfort. The soft suede upper is lined with a smooth leather for comfort next to your foot. To allow the foot to breathe and create a healthier shoe environment there is a leather insole. 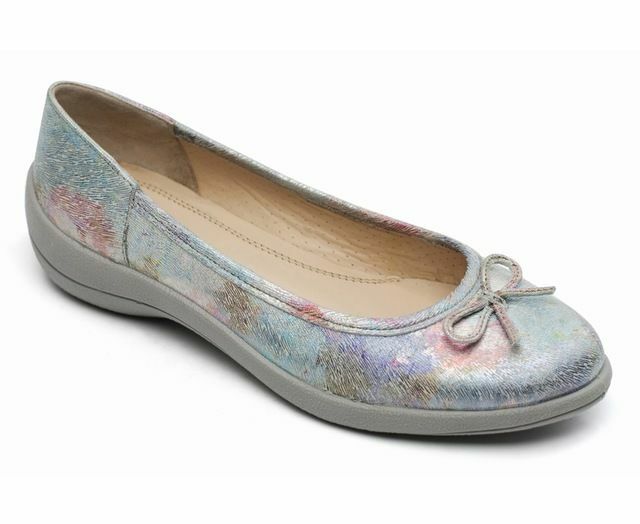 The wedge heel is covered in leather that has a subtle rainbow metallic effect, this leather is echoed in the bow decoration on the front of the shoe. For traction while walking there is a grooved synthetic rubber outsole. The heel height measures 4 cm. This shoe is a wider than average H width fitting. Buy your Alpina women's wedge shoes from Begg Shoes, an official Alpina stockist.